"We went to the Lung Cu tower from Dong Van. The drive up there was not spectacular in comparison to the rest of our motorbiking adventures in Ha Giang. Once there, you will hike up 270ish steps to get to the flag. The views from the top are nice and the flag is huge. There were very few tourists there. It's a nice place to see but wasn't our idea of fun. The little cafe on the right once you get back down is nice to sit at for an iced coffee or water before you head back towards Dong Van.". Lung Cu - is located in the far north of Vietnam. It is for the Vietnamese a significant tourist destination although more and more foreigners come to this place. It is actually a very small village and it has become well known for its high flag tower on Dragon Mountain (or Lung Cu Mountain). The monument consists of a 33 meter high tower on top of a 1400 meter high mountain. On top of this tower on which you may go up, is, a large mast with the Vietnamese flag. From the top, visitors can see the beautiful and spectacular scenery and you can have a look into China. 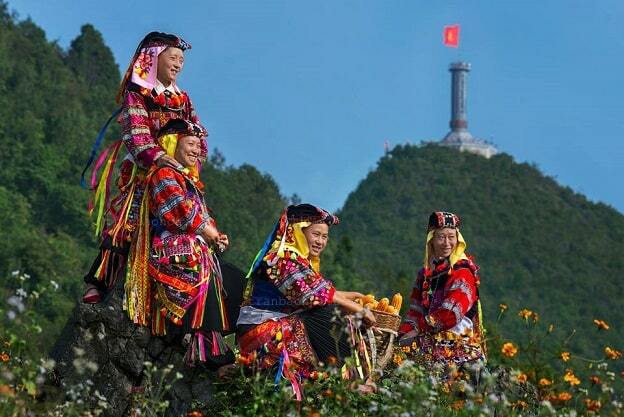 The story comes from the ethnic group Lo Lo, who lives at the foot of the Lung Cu Mountain. According to them there are two semicircular lakes at the foot of the mountain. These lakes are always full of water even in the dry season. They call it "sinks" and they believe that these small lakes are the eyes of a dragon. According to Lo Lo life was formerly in the region extremely difficult because there was always a lack of water. The dragon had compassion on the villagers and so before he went to the hereafter, he left behind his eyes, which were later the lakes. One belongs to the Lo Lo, while the other was assigned to the Mongs. This is another ethnic minority, which lives in the same area. Another story about the origin of Lung Cu existed since the 18th century. Emperor Quang Trung ordered a huge bronze drum and had put it on top of the mountain. Emperor Quang Trung said that hey had to beaten every two hours three times on the drum, as a sign of victory and freedom against their northern attackers. The mountain was called Lung Cu, the original word "Long Co", which means "King's Drum". 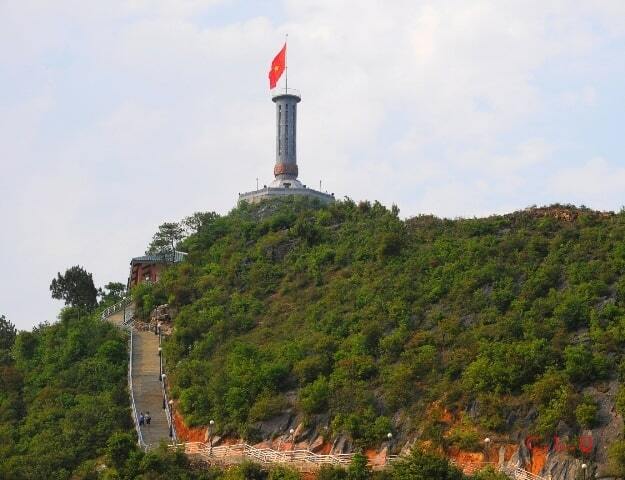 To reach the top of Lung Cu mountain, visitors must climb 389 stone steps and another 140 steps up a spiral iron staircase in the tower to reach the top. The octagonal tower is 33 meters high at the peak. In the lower part you can have a look at the images of Dong Son drums. A 54 square meter flag stands proudly at the top of the tower, representing all 54 ethnic groups in Vietnam. The flag tower shows the sovereignty and the courage of the people and soldiers in the border area of Vietnam. Lung Cu is known for its many special foods and beverages. You can try the alcohol made from honey and corn, or Thang Co soup, which is prepared from all kinds of meat. Lung Cu is 150 kilometers from Ha Giang. 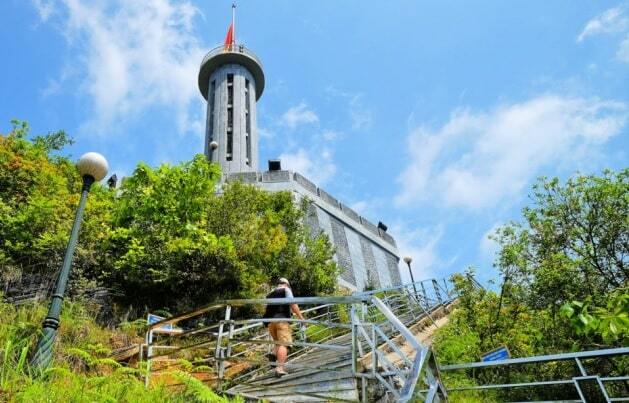 "The flag tower itself stands proudly 1,600m above sea level. Its design is an imitation of the Hanoi Flag Tower, with eight bronze drums guarding the sides of the octagonal tower. The national flag adorning the top of the 135-stair tower has an area of 54m�, symbolising the unity of Vietnam�s 54 ethnic groups. Border guards are tasked with keeping the flag flying in all weather conditions, and have to replace the flag as often as once a week, following the constant battering it receives at such a high altitude. It is a hard task as they brace themselves against strong wind."